Several months back, I allowed myself to get sucked into a little Apple-Dell spat -- err....discussion where an acquaintance of mine, Faruk Ateş, "debunked" the "myth" that Apple charges more for the same hardware. Of course, the systems had differences so the debate raged on, but honestly, I was amazed that Dell's prices were, well...so close to Apple's. Perhaps Apple truly was intent on competing with the PC makers. Fast forward ten months to yesterday when I made a comment about not being Anti-Apple. After proof-reading the article, that comment sparked my memory of the previous Apple-Dell tiff -- err...discussion. I thought I'd take a look at prices now to see if they've changed. To my amazement all models are still available from both vendors so I was able to configure them and take a look. Unfortunately, Dell does not offer the 2.33GHz Core Duo in either model, and this is the only CPU offered today on the Macbook Pro 17. 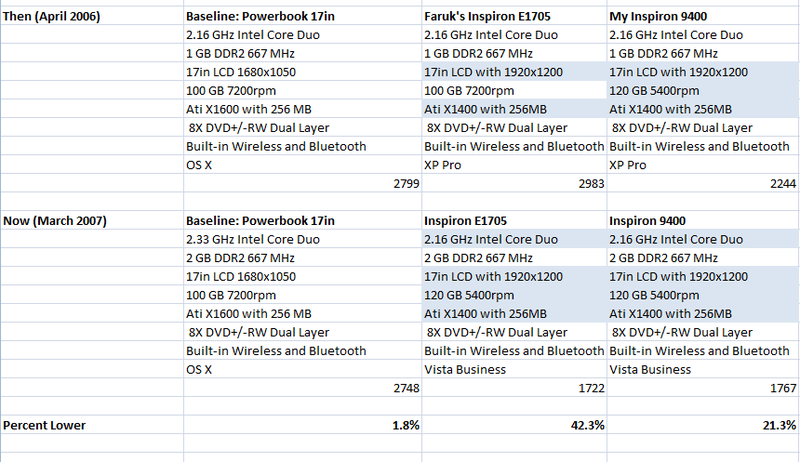 So the disparity between the systems has increased (in Apple's favor) since the previous comparison. Still the price differences between same systems is noteworthy and I feel compelled to share these statistics. The Macbook Pro 17 baseline model now sports 2GB RAM rather than 1GB, and a 2.33GHz Intel Core Duo processor rather than a 2.16GHz Intel Core Duo. Its price has declined $51 to $2748 or a reduction of 1.8%. Since I couldn't match CPUs, undoubtedly the most expensive component within a notebook computer, drawing Apple-Dell comparisons doesn't seem prudent. However, it could lead one to wonder: If Dell can offer the same system with the same CPU and a Gig more RAM for a thousand dollars less today than it did 10 months ago, why can't Apple? Full Disclosure: I am a former Dell employee (Portables Product Division) and Dell stockholder. Another perspective to consider is this. As a business person, just because I can sell my widget for less than...or the same price as my "competitor" doesn't make it a good idea. Yes, Dell must pay for the OS (and you can't find an Apple-friendly blog that hasn't decried the pricing on Win Vista) and Apple does not. Of course, there are other differences -- Firewire being a big one, but I think these numbers show how Apple doesn't seem to want to drop system prices as components drop in price. I mean c'mon, two percent?